Hello again friends. Today we are going to discuss some card choices, and talk about deck types, in Rainbow Stairwell. Rainbow Stairwell is gaining back some popularity, thanks in part to the people tired of net decks. Who are looking for something challenging and different to play! If you are new to Rainbow Stairwell please look here. My how to guide for Rainbow Stairwell, with a card per spot breakdown. Rainbow Stairwell is a singleton format, consisting of 1-6 casting cost for each color and artifact. 4x each basic land, with 4x non basic lands are the mana structure. Making a total of a 60 card deck. No dual colored cards, gold cards, cards with X in the cc or split cards are allowed. Also wishes from judgment are banned in this format. Other than that if its singleton legal, it plays. I encourage all players what ever there skill level to make a Rainbow Stairwell deck. Storm combos - Here you might be thinking what the heck... Well I have built a couple of these decks, and enjoy playing them. With this in mind let us take a look at some of the possibilities. 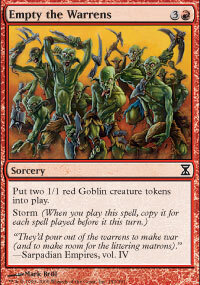 Brain Freeze, Tendrils of Agony, Empty the Warrens and Stormfront Riders are some powerful cards. Toss in some quick mana acceleration and viola! You have the opponent looking and glaring about what just happened. Also consider Wrath of God and Bitter Ordeal. This can be a deck disaster! Control - Let’s face it, we all want to keep our opponent from doing anything. Well maybe that is just me! But if he does get an awesome combo off, it is always nice to push the reset button and look at them blankly. Wrath of God, Final Judgment, and Akroma's Vengeance are some cards that see play a lot. As I said it is always nice to be able to hit the reset button. Also taking an opponents artifact in this format can be huge. It will with out a doubt get there blood boiling. So I recommend Acquire for this. Graveyard Regurgitation - Basically this is EVERY Deck in Rainbow Stairwell. The Graveyard is a huge resource for players in this format. So in other words it is the base of the metagame. All Suns' Dawn is a must for your deck. It is inexpensive and lets you pull up to 5 cards back. For the control addicts out there it is a major target to cut off. Leyline of the Void and Stonecloaker are a couple graveyard haters. Counter spells- I know what you are thinking here. Why would you want to put something you may not see in your deck? Well it is a bomb, waiting to go off. Hardly anyone plays counter spells in RS. Most would not give a second thought to casting whatever spell he or she may get. So that is why I would recommend playing them. Evasive Action, Vex, Frazzle, and Draining Whelk are some good counters for this format. I try to stay away from cards with 2x color casting cost, for obvious reasons. 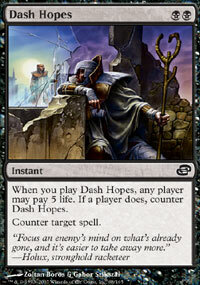 Although Dash Hopes is useful, it’s going to hurt them either way. 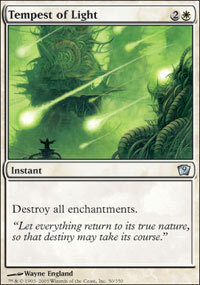 Land Destruction - This is guaranteed to make your opponent VERY unhappy. When I play RS it is very down and dirty, I advocate land destruction. Desolation Angel, Lay Waste, Reap and Sow and Global Ruin are some great cards to cripple your opponent. Toss in a Bitter Ordeal and take out the rest of there lands!!!! Yes, it is dirty. Yes, they will hate you for it. But, they will respect your deck afterwards. Well there we have it. Some easy deck fixes for making your Rainbow Stairwell deck a powerhouse in the format. I hope that the information listed here helps you, and your deck know what you are facing in the realm of Rainbow Stairwell. Below is the deck I am currently working on. It is down and dirty, and is reasonably cheap. If you take out the shock lands. I currently have a deck clinic on the Puremtgo forum. If you need any help building a deck, or would like to show it off to the rest of our mtgo community, please go here. MTGBaron's Counter and Destroy Rainbow Stairwell Deck. Uhm you didn't need THAT did you???? "Woe is he, who mourns the loss of what might have been." Mine!!! Wait you can have him back!!! Great article, Baron. It gives me a little more basis on how to build my deck. Hattivita is right the recurring cadd like tribal lightning are a killer. I think he hit me 3 turns in a row with it yesterday. This is definitely a format where you NEED to be able to deal with artifacts (duh!) and enchantments. Very good to lay that information to peoples' heads, without ways to deal with potentially problematic enchantments you should shuffle=up and leave that match. The Hondens can be devastating and are a MUST to deal with. And, as you pointed out, your graveyard is a VALUABLE resource; Leyline of the Void stops that strategy, you must be able to deal with it as well when it rears its ugly head. For my 3 drop in White, I run stonecloaker... graveyard hate as well as gating... amazing. My 4 drop is the Morphy Daru guy who blows up enchantment when he's turned face up... as well as my 4-drop green Nantuko. I do recommend running at least one way to deal with a land or you may find yourself in a sticky situation with that as well. the shrines are definately meta. like 2/3rds of the decks i played today have them. however. id like to se the expression on their faces when you confiscate their Honden of Night's Reach. 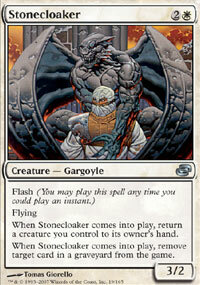 Cloudchaser Kestrel is another very versatile card for your 3 white drop. it can also make you go around protection from colors other than white. Stonecloaker can definately be a good card in the right circumstances, like right before your 5/5 flyer gets struck by terror. i had it in my deck for awhile, i just found the Kestrel more useful overall. especially since i also run stormfront riders. which absolutely owns with cards like Sage Epityr, and Anarchist. Did i hear anybody say recurring Tribal Lightning, Recollect or Call of the Herd?